Starting in 2000, the recruitment of marine personnel is our core business and we have earned a strong reputation in the market. Working with many of the world most prestigious ship owners and operators we provide stability and preferable working conditions to our seafarers. Our office is located in the center of Kaliningrad. 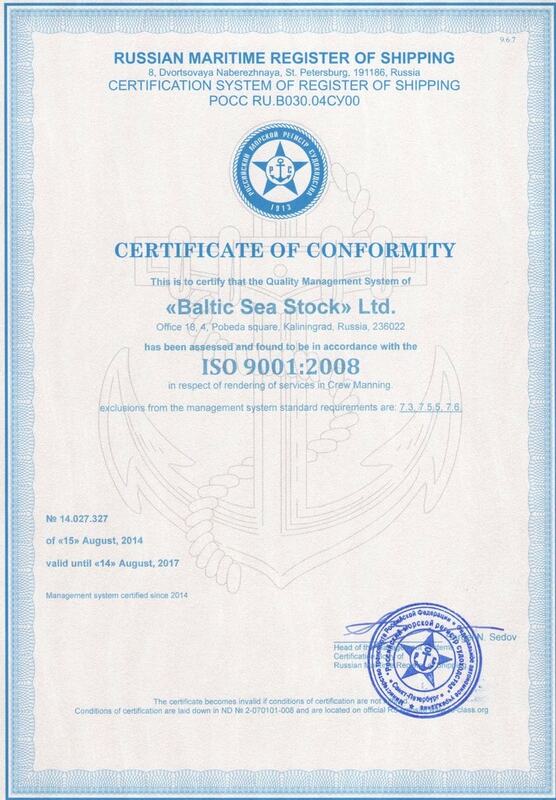 Crewing company “Baltic Sea Stock” is recruiting, training, organization and dispatching crews from all countries both to bulk carriers, refrigerator and container, dry cargo and multipurpose ships, sea tugs and to heavy lift vessels, tankers in accordance with the requirements of the International Security Management Code. The special training is provided on the basis of teaching centers of the Baltic State Academy and Kaliningrad Marine College. The quality of training is proved by the constant inquiries from foreign shipowners. Our seafarers have the proper documents certifying their professional fitness in accordance with the requirements of the International Convention STCW-78/95. 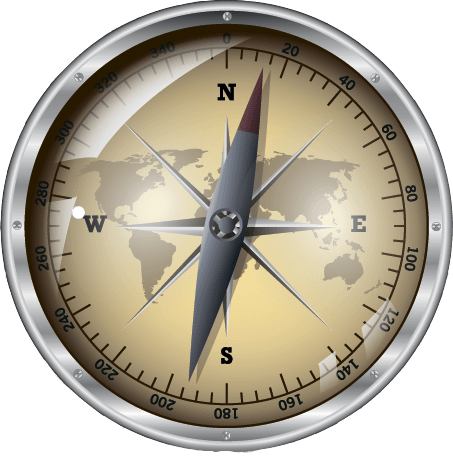 The administration staff speaks Russian, English, Spanish, Polish languages and has marine education with 10 to 18 years of experience at sea, which allows our company to provide experienced recruitment and training specialists. 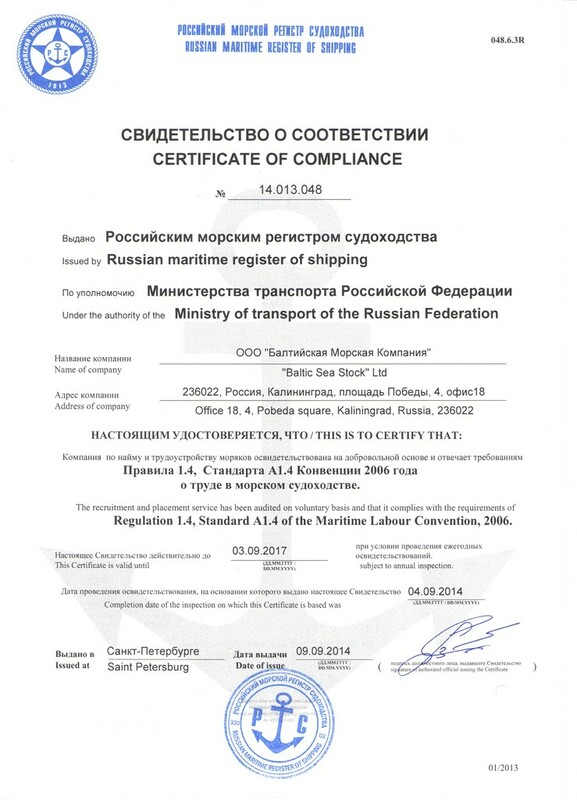 Our company has received official permission from the government of the Russian Federation for crewing services. 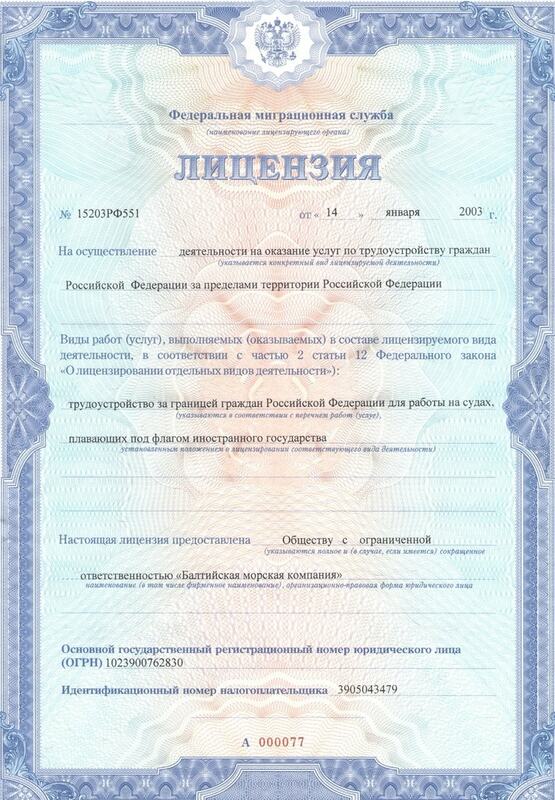 License № 15203РФ551. We are open for cooperation and provide all additional information necessary for our further successful cooperation. We are looking for Chief Engineers and 2nd Engineers for containers vessels. Good contract conditions. Pension schedule. Bonus. For guard vessel we need a captain. The vessel is operating on the North Sea. It should be someone with chase and guard/standby experience who can easily communicate with other vessels and principal on the Pipe-laying vessel. Wages are negotiable and fully depend on the experience / competence and knowledge of English. Need very experienced captains for ahts.good salary, short terms, constant job. Wages allIn for the Captain is US$ 5.500, Chief engineer is US$ 5000. They should be well experienced in maneuvering the vessel for survey work and standby work close to the Oil & Gas Platforms and pipe laying vessels. Contract duration is on three month on and one month off basis. We are looking for candidate chief engineer with cert. less than 3000 kw for offshore support vessels working in Nigerian waters. Contract 3-4 months. Salary 5000 usd.